With 22+ years of experience and over a thousand residential, commercial, & institutional projects throughout the Southeast, Sundance Power Systems is a leading renewable energy company in the region. We are now working in collaboration with Thermacraft Solar Solutions. Together we bring 50+ years of experience so we can serve you better. 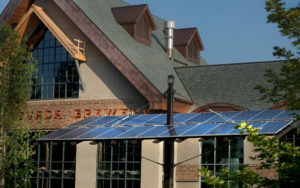 Three separate installations bring energy savings to New Belgium's new Asheville brewery; a radiant floor heating system in the tasting room, and two solar hot water systems. 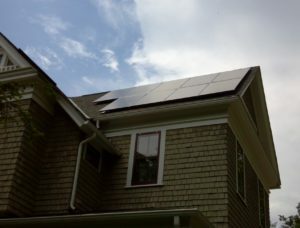 One of the first homes to be certified net-zero, this modern energy-efficient home by Earthtone Builders in Asheville includes a 5.13 kW solar electric system. 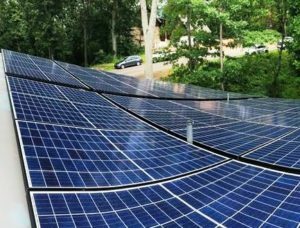 Two solar electric systems were designed for Asheville Yoga Center's facilities, with a combined rating of 29.1 kW. SolarWorld modules were used with Ecolibrium Solar's EcoFoot2+ ballasted racking system and Fronius inverters. Both arrays are net-metered grid-connected systems. 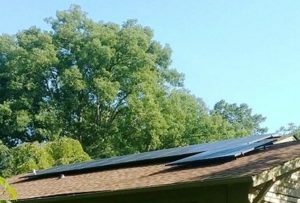 The Basingers benefit from three separate solar projects, with a 3 collector solar hot water system installed in 2008, and an 8.5 kW solar electric system installed at their home in Irmo, SC in 2013. In addition, they have installed solar for their Veterinary hospital. Project profile: This uniquely configured 138.5 kW net-metered solar system will produce approximately 20% of the electricity used by the medical facility, with an annual estimated production of 188.8 megawatt hours of electricity. SolarWorld's 285 watt modules are optimized with SolarEdge technology for maximum production. knowledge, and infrastructure could be counted on." "Sundance was very easy to work with. All of their employees had a great attitude. The job could not have gone any smoother." "Sundance employees are knowledgeable, professional, friendly, and were willing to do whatever it took to make our installation the very best." The decision to invest in renewable energy for your home or business should be an empowering and exciting experience. We work to make the process seamless, always striving to provide the greatest customer experience throughout every step of the process! REC Solar Panels Voted Top Performer Again in 2018!